A significant amount of trimming is necessary when a carcass contains lead shot. This results in loss to the packer. Caviness Beef Packers used sophisticated technology to detect any carcass blemishes, such as injection sites or lead shot. That statement is as obvious as it is ridiculous. But it’s an ongoing problem. Do some ranchers still think a load of lead shot is the best way to gather reticent cattle? Well, yes. Some beef packers consistently find lead shot in hides and even beneath the skin of cattle being processed. Some say it’s due to hunters with a bad aim. Maybe so, but most is likely from frustrated cattle handlers. “They can blame it on hunters if they want — but most is from gathering wild or sour cattle with a shotgun,” says a perturbed Ron Gill, Texas A&M AgriLife Extension beef cattle specialist. Consumers love their burgers and other beef cuts. But with the minuscule chance that a burger is laced with lead shot or other contaminated material, moods change quickly. Thanks to sophisticated equipment used by safety-conscious packers, there’s little chance in that happening. But that doesn’t mean at least one or more cattle harvested every day doesn’t show up with lead shot or bird shot in their hides or even their skin, says Trevor Caviness, president of Caviness Beef Packers in Hereford, Texas. Of the approximately 1,800 cattle harvested daily by Caviness, at least one will carry buckshot or bird shot when examined by initial carcass inspection. If one carcass slips through the keen-eyed packer personnel, that shot-contaminated beef is later identified by further high-tech testing on the line. In either case, processing must be halted and the contaminated carcass removed. That means lost time, lost product and lost money. But the beef did not reach the consumer. “They’re finding bird shot and lead shot in every cow plant, so it’s not surprising they are finding them at Caviness,” Gill says. “A lot of it is cranky bulls. They shoot to try and scare them. But most are cutter cows. “It’s aggravating because the incidence rates are going up. It could be from inexperience in handling cattle. Also, some use rat shot or bird shot from helicopters to gather cattle. They say it doesn’t go through the skin. But it’s in the hide,” Gill says. Jorge Aleman, director of food safety quality assurance at Caviness Beef Packers, shows the effects of bird shot that penetrated a hide. Aleman says of the 1,800 head the plant processes daily, there’s usually one with lead shot in the hide or skin. Caviness is primarily a cow and bull processing plant. About 90% of its cattle are cull cows and bulls, with more of the contaminated carcasses found after calves are weaned. Many come from smaller producers in neighboring states. 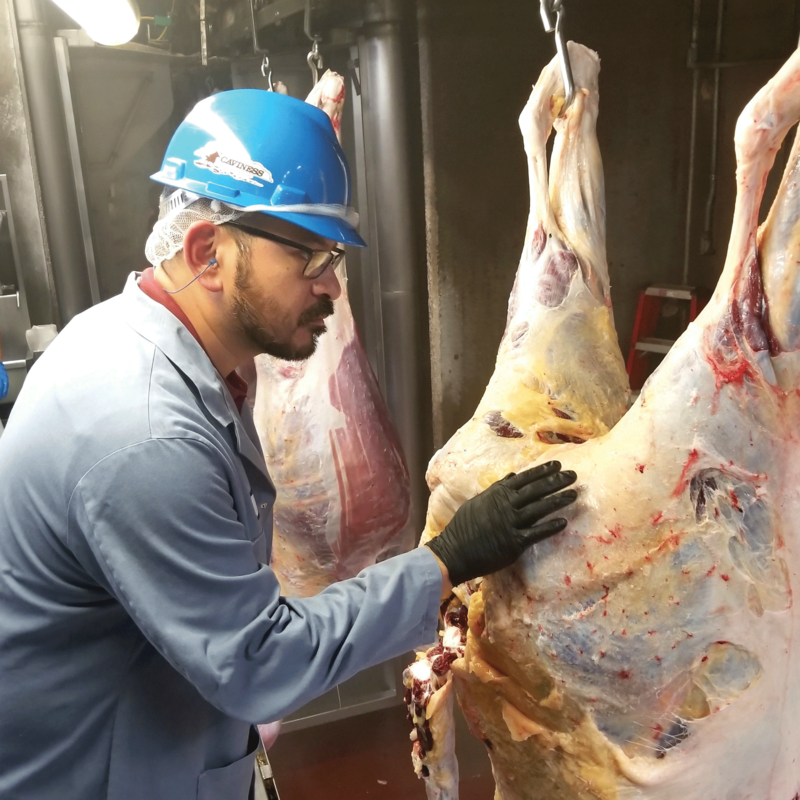 While some packers may be seeing more such cattle, Jorge Aleman, director of food safety quality assurance at Caviness, says the number of carcasses containing lead shot has declined slightly in the past few years. Caviness has tracked the origin of shot-laden cattle, whether they’re from a sale barn or straight from a ranch. “We’ve done extensive tracking and found that it’s not specific from one region or another,” he says. Once carcasses are deboned, they pass through one of three X-ray machines to identify foreign matter. Caviness says it’s key to prevent meat containing any foreign material from getting into the food chain. More producers are going through BQA training. There are specific BQA suggestions concerning lead shot and bird shot as part of its guidelines to deal with foreign matter. He says the industry must self-police itself against cattle being moved with firearms. “We don’t want to face a situation like we have with antibiotic residue withdrawal violations,” he says. For example, if product from a packer is found to contain residue, the packer is required by the USDA’s Food Safety Inspection Service to trace back the origin of the animal. That can be directly to a producer or a sale barn. He says it gets down to treating animals correctly. “In the name of humane animal welfare, the practice of shooting cattle to move them must be stopped. We try to eliminate the use of ‘hotshots’ or any other thing that inflicts pain on animals.